Explore the chapels of Massachusetts on a road trip that will show you the best of what this New England state has to offer in both history and scenery. Massachusetts is dotted with over 100 colleges and universities, ranging from small liberal arts colleges to sprawling universities in the state’s capital of Boston. With their unique New England-style architecture, it’s no wonder that the state’s university chapels are some of the most picturesque in the country. From east to west, here is a list to help guide you on your way to seeing the best that Massachusetts has to offer in collegiate chapels and gorgeous landscapes. 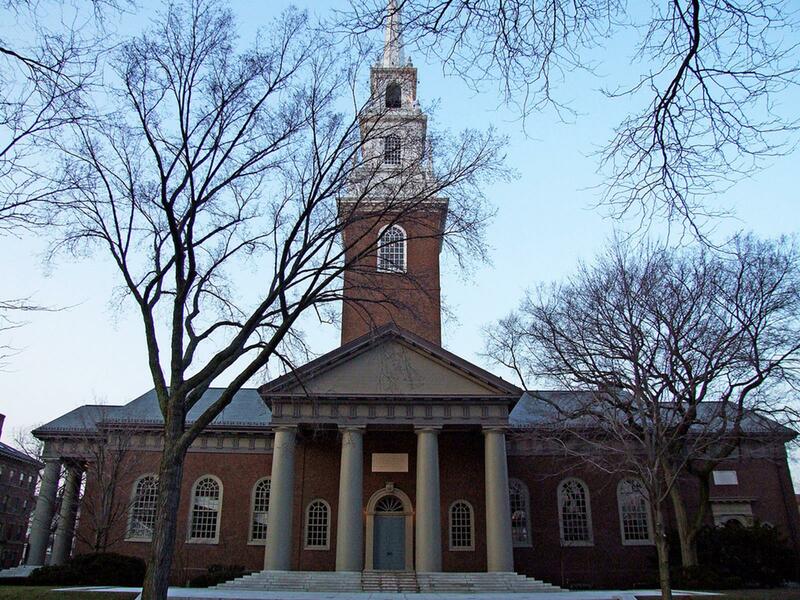 Walking across Harvard University’s famous quadrangle, it’s impossible to miss the striking Memorial Church. With its signature four columns and towering belfry, the church is an impressive feature on the campus of one of the world’s most famous universities. It’s also an important symbol of those who served in World War I, and inside you will find the names of 373 alumni who lost their lives in battle. Since the inscription of these names, further memorials have been erected for World War II, the Korean War and Vietnam War. The church in its current state was constructed in 1932, but several other chapels preceded it until they outgrew the needs of the university’s religious and spiritual community. The church is open to visitors Monday through Friday, 9 a.m. – 5 p.m., with regular worship on Sundays at 11:00am. Events take place daily at the church, from morning prayers to organ recitals to speaking engagements. On the church’s website you can check out events taking place on the day of your visit and listen to broadcasts of the morning prayers. Whether you’d like to attend a service or listen to the Harvard University Choir, the church is always a hub of activity at the center of campus. While you’re on campus, it’s worth taking a guided tour of Harvard Yard. Tours, lasting about one hour, are free of charge and give a unique insight into the university’s history and the student experience. The area just to the south of Harvard Yard, known as Harvard Square, is a lively and picturesque place full of great restaurants, shopping and classic New England architecture. Stop in for an ice cream cone at the famous J.P. Licks and explore the Harvard Bookstore. The church, located in Cambridge just across the river from downtown Boston, is easily accessible via the city’s subway system. This chapel’s unique name (no, it’s not a typo!) comes from 1908 alumna Helen Hills Hills, whose maiden and married names are both Hills. The college did not originally have a chapel, as leaders felt that students should attend services in the local Northampton community. However, seeing the need for a university religious space, Mrs. Hills dedicated money to fund construction. The chapel was completed in 1955 and follows the traditional style of 18th century New England meeting houses, standing out with its all-white façade. The gorgeous exterior is picturesque all year-round, blending in with the winter snow and reflecting the summer sun. Its inner chapel space has been recently updated but is clearly reminiscent of the historic meeting spaces that can be found throughout New England. While technically a chapel, this space serves as a multi-faith center open to the entire community of Smith College and Northampton. Various religious and non-religious student groups use the chapel space on a regular basis, and it is always open as a place of meditation. Concerts and art exhibits occur regularly, as do weddings and other ceremonies. The church is a reminder of the many diverse students that make up the Smith community, and is a symbol of how churches today can extend their reach into all areas of the student body. Northampton itself is a quaint New England town with Smith College at its center. On campus check out the Botanic Garden, and for those interested in a bit of history, it’s worth paying a visit to the Calvin Coolidge Presidential Library and Museum in the center of town. Smith is a part of the Five College Consortium, making it a prime location surrounded by other great institutions just a few miles apart. 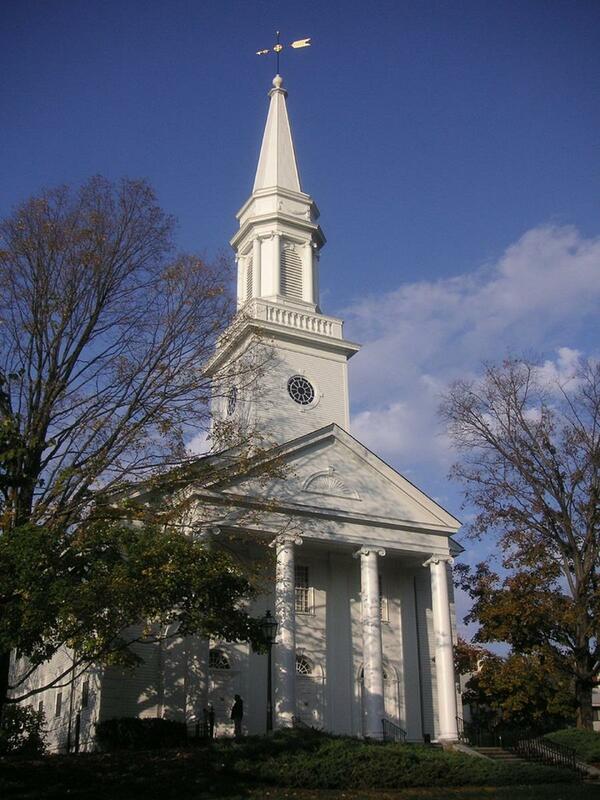 You can consider bundling your visit with a trip to the chapels of Amherst, Mount Holyoke, Hampshire and U Mass Amherst. Smith’s campus can be reached by heading north on Interstate 91 off the Massachusetts turnpike, or via the Amtrak Vermonter line. 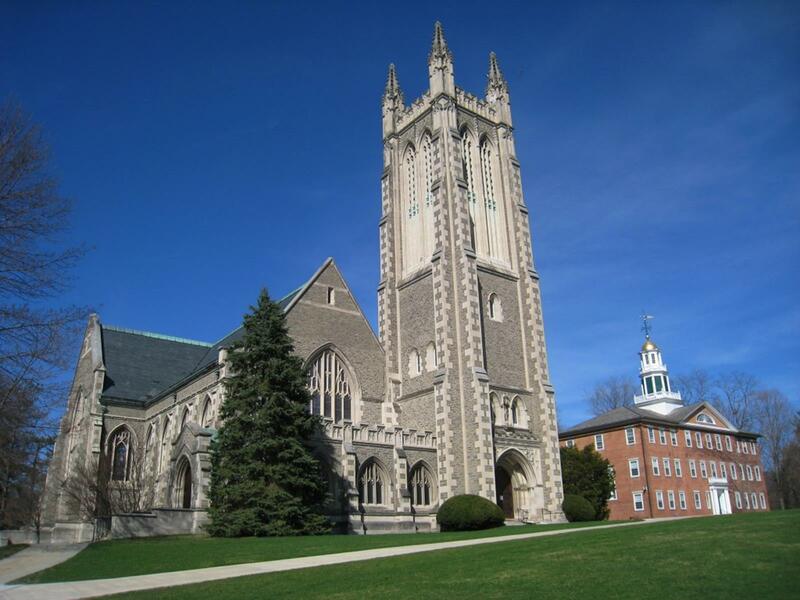 Completed in 1904, Thompson Memorial Chapel at Williams College serves as a sanctuary where all may feel welcome and at home, whether or not they affiliate with a particular religion or faith. The chapel’s British ancestry is evident in both the windows and tower. The former were made in Birmingham, while the latter is a replica of a church in southwest England. The church itself is a stunning gray, and its tower is one of the most prominent symbols on campus. A popular place for weddings among Williams alumni, it is also used weekly for concerts, gatherings among organizations, and, of course, worship services. An Inter-Faith common room, a room of the Blessed Sacrament, a Muslim prayer and meditation room, and other common spaces for student organizations to gather fill the space, making it a popular and diverse place on campus. The campus of this small liberal arts school is easily walkable, and Williamstown itself is dominated by the campus. When you’re hungry, there are plenty of on-campus options clustered about to fill any craving, or head just off campus to Water Street for a few more options. If you would like to check out more of the quaint small towns that New England is known for, head about six miles east to North Adams where you can stroll along a pleasant Main Street and pay a visit to the Massachusetts Museum of Contemporary Art. Or, head just a few miles north and you’ll find yourself in Vermont, where the sprawling Green Mountains make for an excellent day trip for hiking and stunning views. Thompson Memorial Chapel is open to visitors seven days a week from 7:30 a.m. to 11 p.m. You can check out the link here for a self-guided campus tour. If you’re traveling by car from the east, head north on Interstate 91 and west on Massachusetts Route 2 to arrive in Williamstown, located in the far northwest corner of the state. Have you had the chance to visit any of the churches listed here? Are there any must-sees that you would add to the list? Tell us in the comments below!